The obvious criticism is that John Barrowman is too young and good-looking to play Albin, especially given the actors who have played the role here previously, but by casting an equally younger-looking and handsome Simon Burke as his lover, this production has been cleverly reconceived. 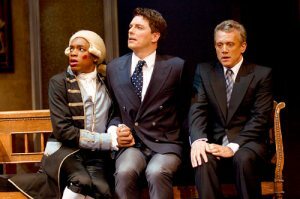 Instead of being a meditation on a drag queen at the end of his career, the focus here is more on Albin's insecurities about his relationship with Georges, the comment about not being able to play Salome any longer becomes more of a bitchy aside than a sad statement of truth. There has been a considerable injection of raunchiness into this production, with some very suggestive croissant eating that was dangerously close to the bone (fnarr fnarr) for a family show. However this more overt sexuality played very convincingly with the younger coupling and led to some hilarious scenes. Barrowman was actually much better than I thought he would be, fitting easily and comfortably into Zaza's heels and working the audience like a dream. The only downside for me was his rendition of 'I am what I am': beautifully and emotionally sung in the first verse, the man described as an "Entertainer with a capital E" in the programme then slipped into Singing a Showtune with a capital S and lost much of the emotional impact that the song should have, reclaiming it only with the final dramatic flounce out of the theatre past his distraught lover. For me, Simon Burke was the real revelation here though. Only ever having seen him as a serious act or in straight roles, his Georges was probably the best one I have seen yet. His singing was superb, his MCing was genuinely funny and he works really hard at creating the meaningful relationships with his lover and son that form the heart of the show. His chemistry with Barrowman is a delight to see, they obviously revel in each other's company and their final scenes together were beautifully touching. 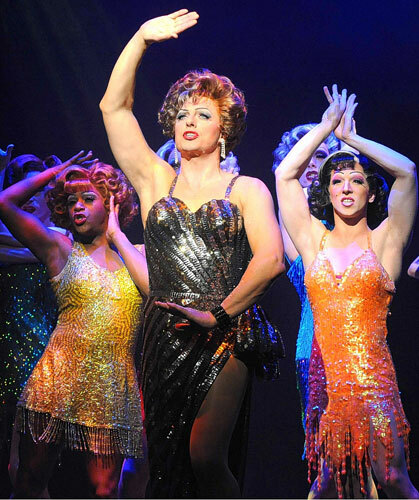 Tracie Bennett remains great fun as the bawdy Jacqueline, and the Cagelles still wow with their eye-popping routines. 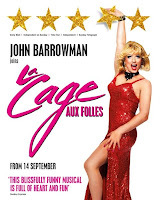 Perhaps surprisingly for some, this production has really has breathed new life into the franchise and it is the perfect vehicle for Barrowman's talents and current public persona. It remains a cracking trip to the theatre, with as fun an atmosphere as you can currently find in the West End: there was even some heavy-duty corpsing thrown in for good measure which just added to the fun inside the Playhouse. Douglas Hodge and Philip Quast reprise their roles from 30th November, but when this closes on 2 January, the West End will become a duller place for sure.